What Is the Function of Resin Canals in Pine Needles? The needles of most pines contain resin canals, usually two or more and occasionally as many as 20. The canals are located in the mesophyll of the needle, the photosynthetic portion of leaf between the upper and lower epidermal layers--"marginal" canals are closer to the epidermis while "medial" are more fully embedded in the mesophyll. The ducts are typically lined with several layers of epithelial cells, thin-walled on the interior and thicker outside. The resin itself is an organic liquid containing terpenes, resin acids and other compounds. In addition to pines, a number of other conifer species, including Douglas fir, exhibit resin canals in their needles. Pine needle resin serves as defense against insects and other animals, which confront the distasteful substance when boring into the conifer's leaves. The resins may disrupt the feeding, digestion or metabolic function of the attacker. However, a number of insects specialize in feasting on pine needles, including the pine needle sheathminer, the pine needle scale, and the ponderosa pine resin midge. Sawflies, which can sequester pine resin in their own bodies for defense against predators, may sever resin corridors when laying eggs within needles. 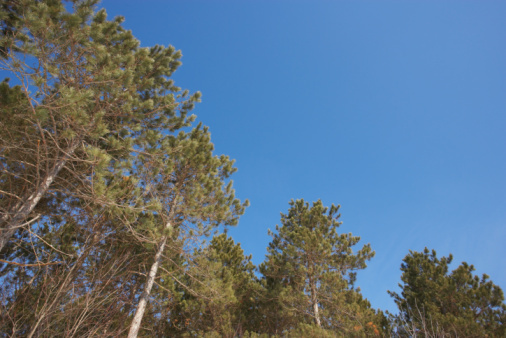 The Canadian Journal of Forest Research reports that fertilizer application may induce an increase in the number of resin canals in pine needles, as well as in the xylem of some species. Ducts of resin are also found in the wood of pines. When the bark is wounded, resin pools out and forms a protective layer, essentially akin to a scab. Insects may be trapped in this resin ooze, which, when fossilized, becomes amber. While periods of water stress, like prolonged drought, may limit a pine's resin production and thus make it more vulnerable to insect attack, mild drought limiting plant growth (but not photosynthesis) actually allows the tree to devote more resources to resin production. While some insects can circumvent the resin defense of pines, all things considered, the system likely remains advantageous because the canal systems facilitate rapid, widespread and contained delivery of the protective toxins throughout the tree. For the conifer-targeting insects, meanwhile, consuming resin-rich needles or bark may be dangerously toxic, but can also transfer the anti-predator effects of the resin itself.